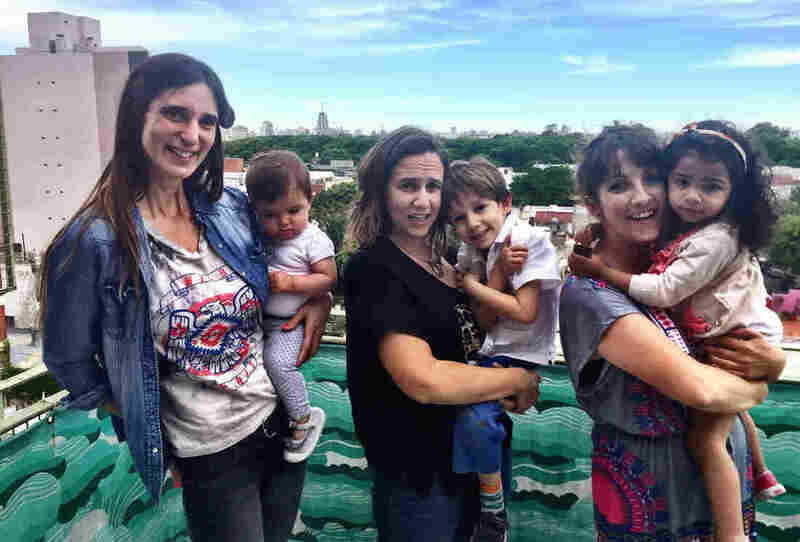 Maria Mercedes Vittar (from left), Paola Fiorita and Ana Zappella are all unmarried mothers in Buenos Aries who often spend time together. In Argentina and most other Latin American countries, well over half of all babies are now born to unwed mothers. María Mercedes Vittar is a human resources manager and a tall, willowy mother of two. When we meet, she has 7-month-old Lupita in her arms. The baby is the product of a short-term relationship Vittar had with a co-worker. Vittar's other daughter, Azul, age 3, is spending the day with her father, Vittar's former boyfriend with whom she had a five-year-relationship, since ended. So Vittar has two children, with two different fathers, and she is currently unattached. And she's perfectly fine with that. "I really like Lupita's dad, but we weren't in love. Lupita was a surprise. It never even occurred to me to have a formal relationship. He lives in his house. I live in mine," she says. And, she adds emphatically, it was her choice. "Things have really changed." she says. "Today, we women are a lot freer. We decide what we like and don't like. We work. We are independent. And that gives us a lot of strength. We can do it alone if we have to." Vittar says she has excellent relations with both fathers of her children, and they are financially and personally involved with their respective kids. "I come from a very traditional family. My parents are still married. I didn't expect this life," she adds. But luckily, she says, "I live in a time when none of this is strange." She gives an example. At Azul's birthday, the girl's father attended, as did the ex-wife of Lupita's father, with her kids, Lupita's half-siblings. Sound confusing? It's rapidly becoming the norm in Latin America. At the apartment where I met Vittar are two of her close friends. They all vacation together and hang out all the time. Vittar explains that they are part of her extended family too. "We are a big group, so we all support each other," says Ana Zappella, a single mother of Ambar, 2. Paola Fiorita, a photographer, lives with the father of her child, Lucio, age 3, but the couple is not married. Fiorita says having a child was far more important than the ritual of getting married, which she sees as just paperwork. She says there are no perfect families anymore. "I think you create the family for your child. I don't think my son's family is just us and his grandparents, but we are all aunts and cousins even if we are not biologically related," she says. Maria Esther de Palma is the president of the Argentine Society for Family Therapy. "Things have changed so radically that now there is a huge diversity that is deemed acceptable, and it is valued. You don't have to get married like before to have a place in society," she says. The explanation for those shifts includes the onerous marriage laws here. Until 2012 in Argentina, you needed to wait a lengthy period for a divorce and give cause, and there were stiff financial penalties for breaking up. Instead of keeping people together, it made a younger generation not want to get married at all. "The model for the younger generation is to place importance on the content of the relationship and not the form it takes," says Barbara Schmidt, a psychologist who has studied the issue. Marriage has become so uncommon that there are now fake wedding parties attended by paying guests who want to have the experience of going to a nuptial. Which isn't to say it's easy to be an unmarried mother. Back at the apartment, María Mercedes Vittar says, though, that's not the point. She says there are a lot fewer value judgments about the choices she and other women have made in Argentina. "We are the families of the future." Or, actually, she says, reconsidering, the families of today.